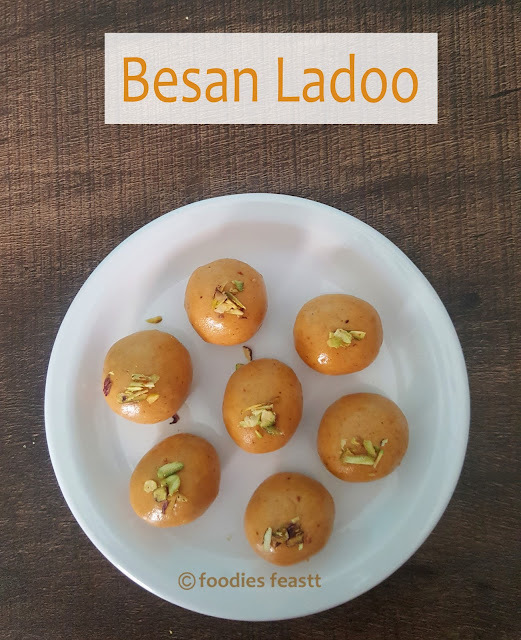 Besan ladoo is one of the most popular Indian sweets liked by all age groups. It is not only easy also very healthy and delicious. 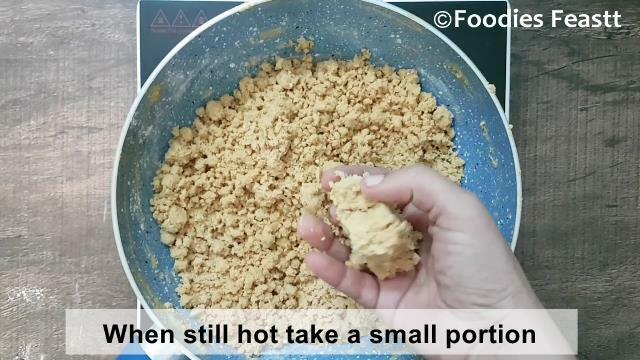 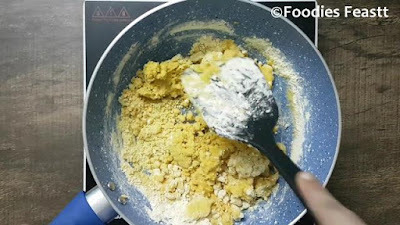 While making these ladoos always keep in mind to roast the gram flour well. If it is under done or over done it would completely ruin the taste of the besan ladoos. 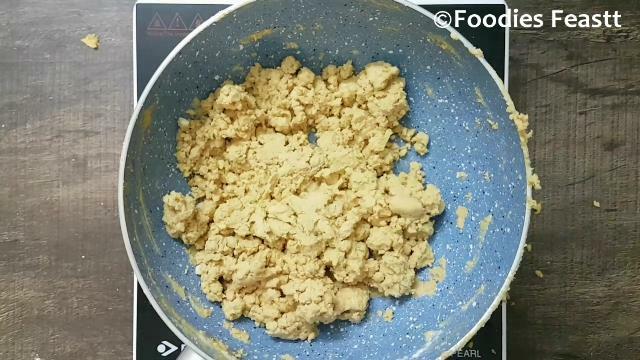 Under done would give you the raw taste of the gram flour in every bite also the besan (gram flour would stick to your teeth. 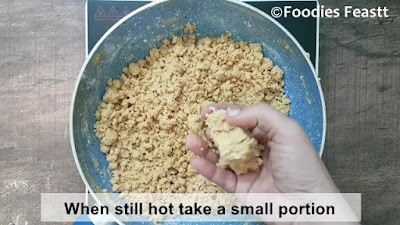 If over done the ladoos would smell and taste burnt up. 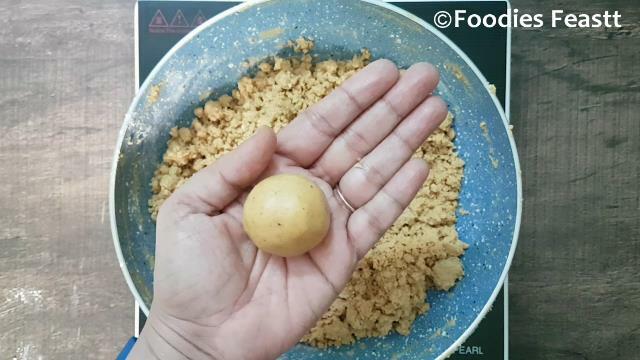 Also the proportion of the besan and ghee is essential as the correction proportion would yield smooth, glossy, ghee tinted textured besan ladoo. 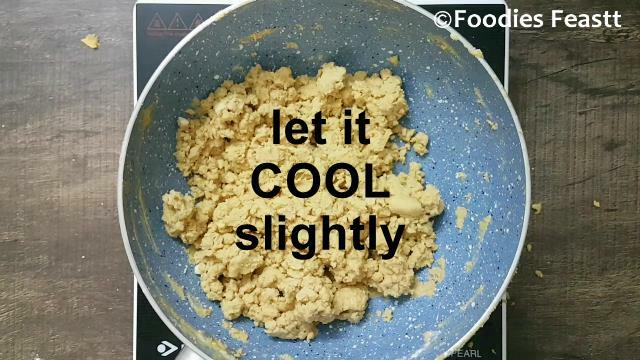 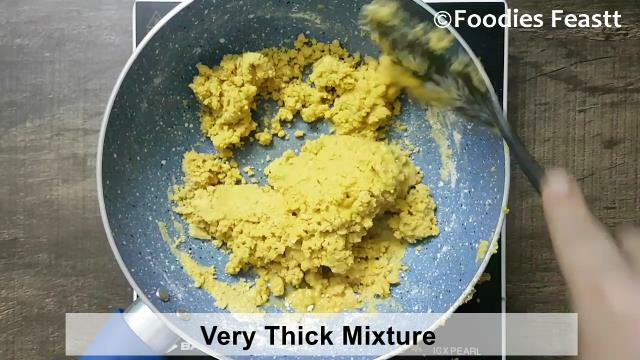 Also less ghee would result in thick mixture which in turn would be very hard to move with your spatula and hence would not be roasted evenly. 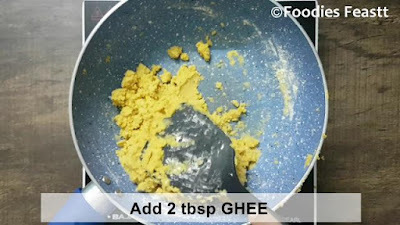 So check and add more ghee as I did. 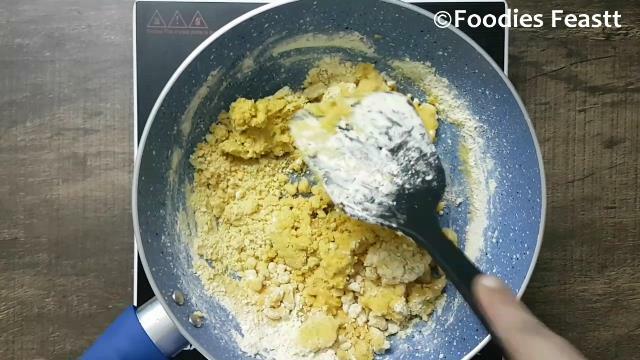 Other points to be considered are mentioned below after the method section. 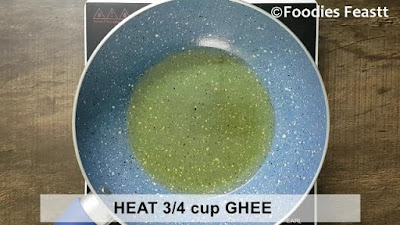 In a pan heat ¾ cup ghee. 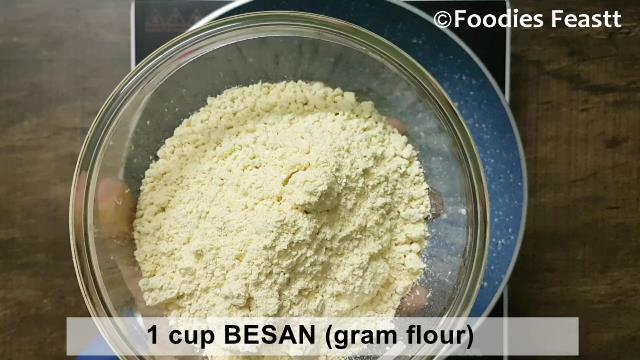 When hot add in 1 cup of besan (gram flour / chickpea flour). This is the time when you need to check the consistency. If the mixture is too hard to mix like shown in the image below then add 2 tbsp of ghee. 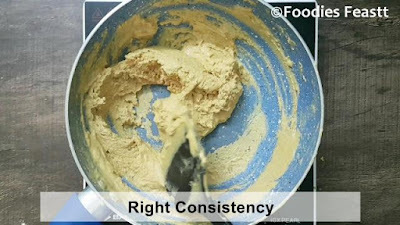 Mix well and get the right consistency as shown below. 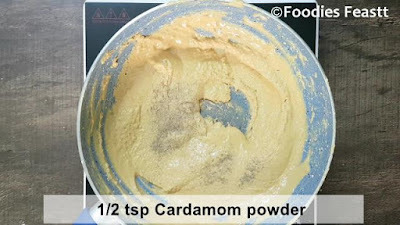 Now add in the ½ tsp of cardamom powder and mix well. 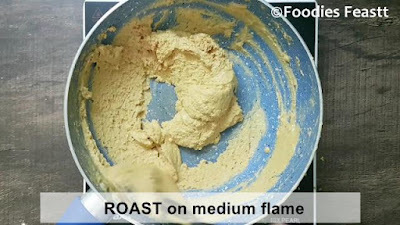 Roast till the mixture turns nice light golden brown. 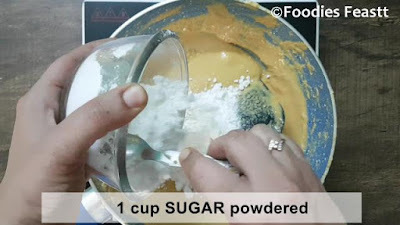 Now turn off the heat and add in 1 cup of powdered sugar and mix it nicely. 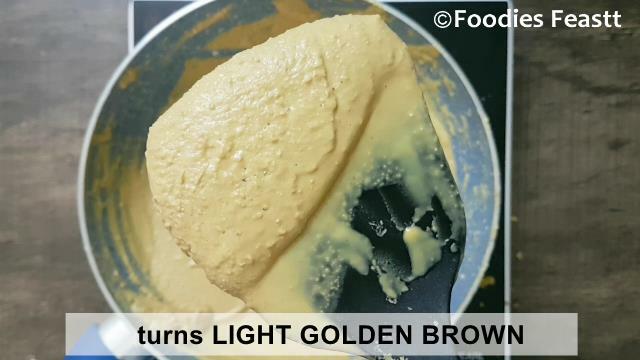 There should be no lumps of sugar left. 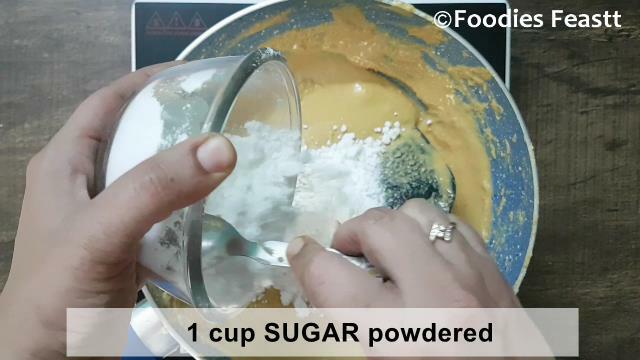 You can also sieve the sugar before using. Let the mixture cool slightly. When still hot take small portion of the mixture and make round ladoos of the size you would like to have. 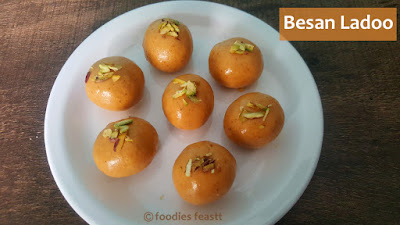 The besan ladoos should be smooth, glossy, ghee tinted textured. 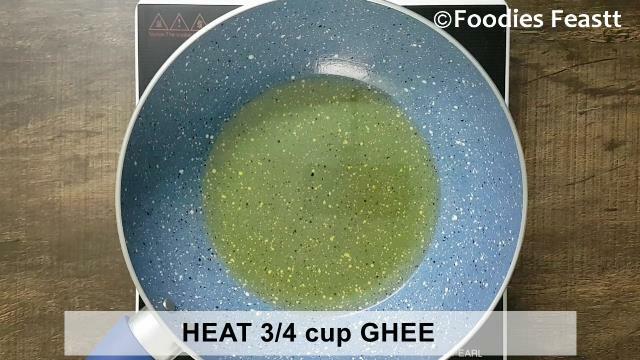 Add in more ghee if needed while roasting. 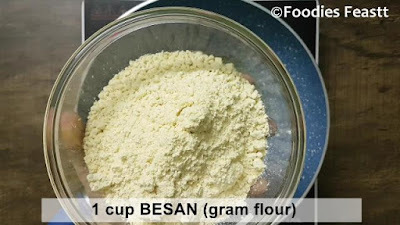 If the mixture is thick while roasting, it would become more thick and dry after adding the powdered sugar so maintain the consistency as shown. 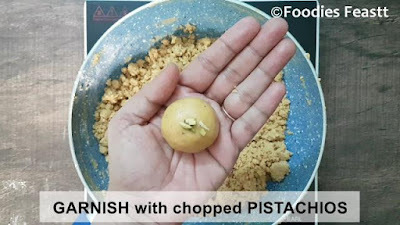 Dry fruits can be used of your choice. So this festive season go food-a-licious with this very healthy sweet. Do share in your experience with us via comments.